Comey Calls For A Coup? 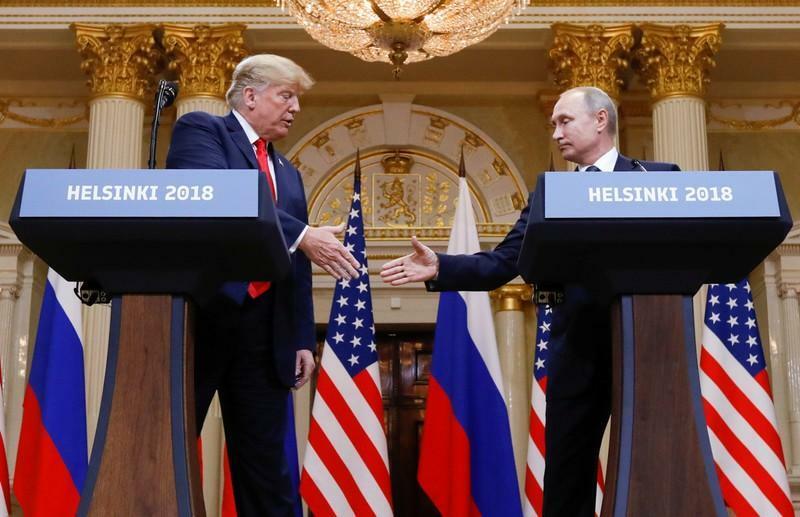 "Patriots Needs To Reject The Behavior Of This President"
President Trump's language and demeanor at Monday's summit in Helsinki with Vladimir Putin sent his detractors on both sides of the aisle into fits, just 72 hours after the Department of Justice indicted 12 Russian officials for hacking the DNC. Trump's position has more or less been that peace with Russia is more important than election meddling, which didn't influence the election - and that the United States has been meddling in elections for a long time, so perhaps let's mend fences and move forward as two nuclear superpowers. Also Hillary sold Russia 20% of American uranium after a bunch of people connected to the transaction heavily contributed to her foundation, which was approved by a rubber-stamp committee, four months after Bill Clinton collected $500k in a speech to a Russian investment bank during a trip where he hung out with Putin at his house. All pre-Crimea of course, so no biggie. The Rigged Witch Hunt, originally headed by FBI lover boy Peter S (for one year) & now, 13 Angry Democrats, should look into the missing DNC Server, Crooked Hillary’s illegally deleted Emails, the Pakistani Fraudster, Uranium One, Podesta & so much more. It’s a Democrat Con Job! After former CIA Director John Brennan called Trump's performance "nothing short of treasonous" earlier in the day, former FBI Director James Comey issued what may be construed as a call to action against a sitting US President. "This was the day an American president stood on foreign soil next to a murderous lying thug and refused to back his own country," adding "Patriots need to stand up and reject the behavior of this president." This was the day an American president stood on foreign soil next to a murderous lying thug and refused to back his own country. Patriots need to stand up and reject the behavior of this president. While this appears to be the first time Comey has suggested citizens rise up against a duly elected sitting President - the extreme end of which becomes a coup, Brennan suggested last July that White House officials refuse to follow direct orders in the event that President Trump fires Special Counsel Robert Mueller. "I think it's the obligation of some executive branch officials to refuse to carry that out. I would just hope that this is not going to be a partisan issue. That Republicans, Democrats are going to see that the future of this government is at stake and something needs to be done for the good of the future," Brennan told CNN's Wolf Blitzer at the Aspen Security Forum, effectively calling for a coup against the president should Trump give the order to fire Mueller. So the DOJ indicts 12 Russians one business day before Trump meets with Putin, and MSM outlets far and wide crank out pieces like veteran NYT employee Charles Blow's Sunday op-ed "Trump, Treasonous Traiter" hours before the event. Combined with Trump's dismissive attitude towards Russian hacking and a nation whipped up by surely coincidental Russian indictments and MSM hit pieces, things could not have gone better for team Hillary and crew. You know @POTUS had a great meeting w/Putin because the media and the global elite are hysterical. Note: These are the same people who have enabled terrorism to flourish, unlimited wars, condemned generations to poverty, stolen prosperity&misinform the public to control outcomes.